Ballad of The Absent Mare | A blog about, but not limited to the Femme Fatale in cinema. Men are machines. We are engines screaming down the hot asphalt, expressionless. We smell of octane, and rust with age, and we’re fueled by all the spit and blood of every man before us that tried to mold us into something strong, fast, and unrelenting. We flex our muscles with every engine rev, and our steely eyed glares cut through the night. We are not of flesh, but of steel and grease, made for one moment to rise, then fall, and then laid to rest in a quiet, grassy yard. Perhaps that isn’t the essence of Monte Hellman’s meditative road film, but in each sad eyed, far off stare of The Mechanic (Dennis Wilson) and The Driver (James Taylor) one can’t help but feel a sense of detachment. These two men, machines, are more in tune with the sound of the screaming engine, and the hiss of the road under the tires then they are with any human kind. Even the Girl (Laurie Bird) aching to belong to something, and blindly pawing for love, can’t warm the flesh that binds the machine. Then there is the character of G.T.O (Warren Oates). He is a rusted machine, clinging to his final coughing breaths of exhaust as he limps down the road. With each tale he spins you get a sense of a man searching for his humanity, so much so that he makes a mockery of it. He wants his moment in the sun. He wants to hear the engine howl one last vicious song, and then slump into the waiting arms of something he will never understand. Has their been a director more un-appologetically garish, and visually indulgent than Josef von Sternberg? No, there hasn’t. Von Sternberg’s visual style is the cinematic equivalent of a sweet 16 birthday cake, and that is exactly what makes his films so engaging. Instead of revolting the viewer his visuals, from the costumes, to the meticulous set designs, play on childhood fantasies and nightmares. They are fairytales in the truest sense, with over-the-top villains, batting eye damsels, and sets decorated from one corner of the screen to the next. 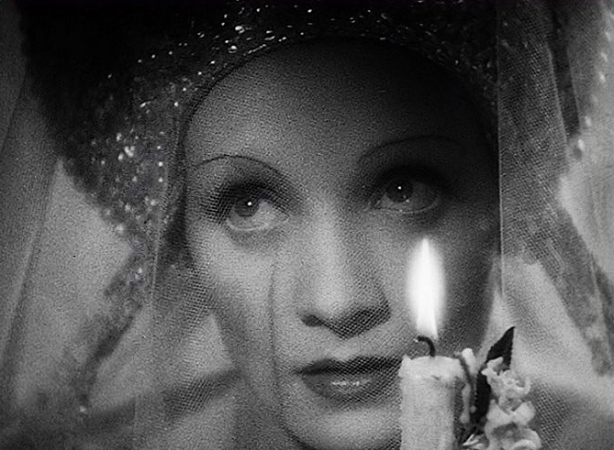 In The Scarlett Empress, Catherine The Great, played beautifully by Marlene Dietrich, is the quintessential fairytale princess, but like all of von Sternberg’s characters, just like his visuals, she is the perversion of everything we have come to expect. Dietrich’s innocence and naivety pours out of every wide-eyed stare she gives. Her sexual curiosities are palpable along with her fear of the great unknown. Later in the film she is the heroine, jaded and vile in her righteousness, and her pleasantries with the men are sweeter than any candy. We don’t just root for Catherine, we lose ourselves in her. We are seduced by her and the dreamy romances of her world. My only wish for this film is that it were longer. It would be a joy to see Catherine’s struggle and subsequent triumph played out more. But I reconcile this with the thought that the film isn’t so much about her struggle and ultimate triumph, but a brief glimpse into a past that never existed. It is a frosty day dream of spectacular notion, meant only to be visited briefly. 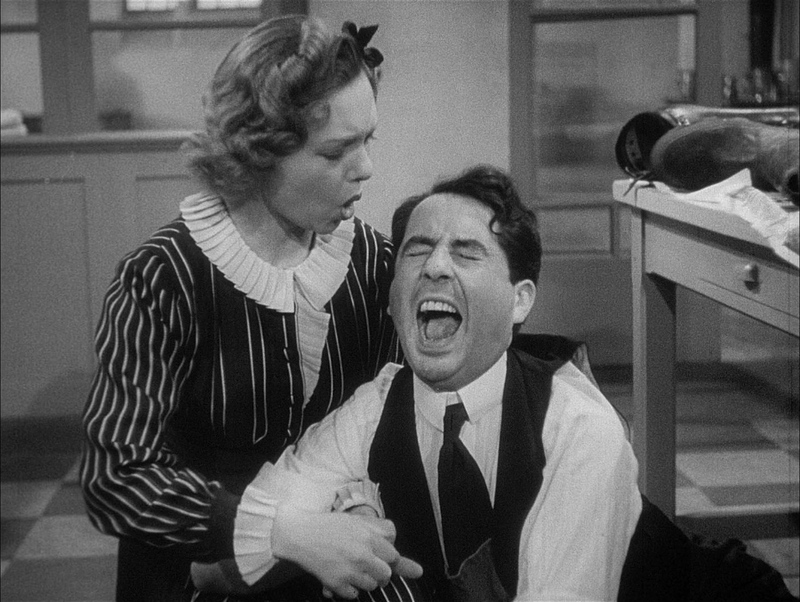 The characters in Jean Renoir’s The Rules of The Game are less people, and more celestial bodies. They move throughout the vast empty of space with a blind trust in the rules of gravity. Gravity will guide them clear of danger. Gravity being the social norms and protocol of societal living. But, in their universe, just like ours, the bodies will find each other. The irresistible pull of gravity can cause violent crashes. Within the violence the known principles of gravity change, become unrecognizable, and destroy. Renoir is not interested in pitting one side against another with his film. Making the bourgeoisie look vile and unfeeling would be too easy. Instead, he gives us human beings from all ends of the socioeconomic universe, with all the range of emotions, and vulnerabilities we recognize in ourselves. We watch them crash into each other, attract, and repel. And all of them with varying degrees of understanding in the rules of society. Renoir takes a great deal of delight in playing out the absurdity and constraints of societal protocol. One can almost hear him giggle with every breakdown. There are people who write their names in the dust of pulverized brick from crumbled buildings. But, it is not their choice to live with such doom. It is, instead the prophecy of the tribe. Tribes in backward old mountain towns in West Virginia. Rusted can towns somewhere in Pennsylvania, and dusty ghost towns out west there. You only go as far as the tribe goes, and it goes through the steel mills, the blue glass of old mason chairs and a muddy back yard. They’re places where dreams snap like fire crackers on a summer side walk. Where rusted cars have memories and the folks have memorized every pot hole in main street. Those places that smell like an old book and everything is smeared with wet ash. And the people paint their bodies loyally for the tribe. When given a glimpse at love their stone hands fumble it, because if it’s anything more than a twinkle of an eye in a beer puddle, one might have to leave the tribe. What are dreams but memories sent through the twists of our brains? We relive our events through the emotion that seeps through the images that flash before our sleeping eyes. Sometimes they are potent enough to leave a residual fog when we wake. It is in this space, where dreams become entangled with memories, that director Raoul Ruiz chose to place his film, Time Regained. With it he forfeits any real notion of storytelling, and instead drifts from moment to moment as frantically, and nostalgically as the dying mind of our main character, Marcel Proust, can move. What Proust, and we the viewer, witness is the unfolding fragments of his unfinished novel. In his final grasps at life, the novel takes on a stream of consciousness autobiographical tone, but nothing is ever definitive, scenes dreamily fall into one another, and characters float in and out of each others lives like slowly moving clouds. 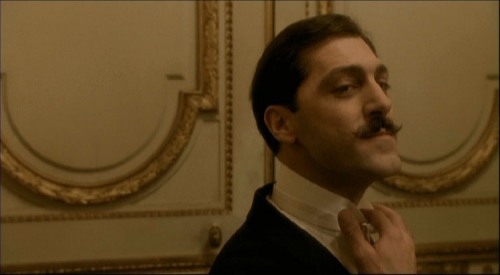 Because of the fragmented, stream of consciousness nature of the film, there are moments where Proust momentarily fixates on characters (people) from his past. This adds a richness to each character, and scene that is never abandoned in the drifting style. When Proust’s memory wanders, the characters, and all of their flaws and triumphs travel with him. And it is apparent early on that through these people Proust measured and observed his life. The object for Ruiz is to capture the fleetingness of life, and memory, and how closely related memory is to dreams. There is an effortless surrealism that paints our memories as they fade. Soon, we begin to wonder if it is the moment in time we remember, or just the memory itself, as it bends, fades, disappears, and reappears in shockingly vivid color. Ruiz makes sure that every scene has a dreamy headed feel by always keeping his camera moving. It meanders like the minds eye through the pages of Proust’s faded memory. And in no scene is this style more powerful than the concert scene. It is the emotional zenith of the film as we watch Proust, overwhelmed with the creeping phantom that it his mortality, and his past. It is both the most humanly grounded scene, and possibly the most surreal, as the crowd surrounding Proust seems to sway, and rotate around him. It is extremely rare for a film to be such a deep well of human experience and emotion, and find itself so detached from notions of reality, but Raoul Ruiz straddles the line brilliantly. The emotion is the surrealism. 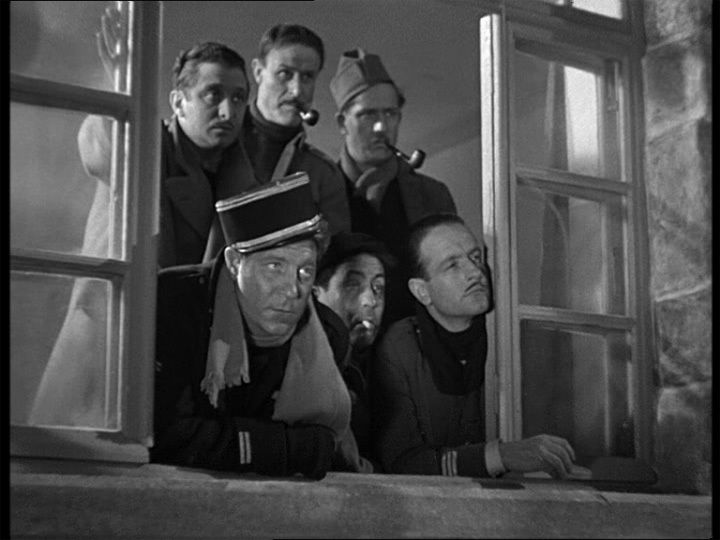 Jean Renoir has said La Grande Illusion is about relationships in a war fought almost entirely by gentlemen. In depicting such poignant, but all together casual relationships, between gentlemen in war, Renoir poses the idea that war itself is the beast, perhaps birthed by man, but man is not defined by his creation, however ugly it may be. We are introduced to men on both sides of the line struggling, not to tame the beast of war, but to rise above it. We see in strained conversations between soldiers the refusal to give in to anger and judgement, and a calm sympathy between the weary. Though the film was made at just the cusp of World War II, Le Grande Illusion serves as a solemn reminder of what was lost in the second war, and what can never be salvaged. I’ve now seen The Thing an estimated 25 times. I have no way of knowing the exact number, but 25 seems like a round enough guess. All the times I watched this film prior I would often get caught up in the paranoia and claustrophobic feel of the film. It is a film you feel rather than analyze, and John Carpenter’s minimalist camera work, and emphasis on tighter shots, and clever editing heighten the experience. What holds this film together more than anything is the sharp and detailed script. Obviously this film is not a character study, so the emotions of each character are limited, but there is great depth in their words and actions. There is an intense mystery at play, completely separate from the horrors of the monster, which takes a secondary role to the horror of paranoia and abandonment that each character faces. When we find ourselves wholly giving into the experience of the film we begin to question every character’s actions and words, right down to the most mundane and seemingly harmless. The best example of this is in what is perhaps the very essence of the film, the final scene between MacReady (Kurt Russel) and Childs (Keith David). They’re the last men left, and in their brief conversation we can infer so much. Is Childs the thing? Is MacReady the thing? Are they both the thing? What makes the scene so strong is how tightly wound the film was leading up to it, which would make you believe the two men are asking themselves the very same questions at that point. It doesn’t work as a mockery of the events leading up to it, but rather, a deeply disquieting overture. If we don't. remember me.